With many UK schools facing budget cuts, music is one of the subjects being hit the hardest. Here at Andertons Music Co. we are strong advocates for maintaining music in the school curriculum. As a childless 24-year-old, you may think I’m too young to gauge the impact learning an instrument has had on me. Not to mention the parental perspective. But that’s exactly the point – I can put myself in the shoes of the learner, as it wasn’t all that long ago. I’ve played the guitar for over 12 years, so I feel that I’ve had more than enough time to evaluate the effects. The experiences that have come with learning an instrument have all been valuable. Before I took an interest in music, I was a keen tennis player. I was also a perpetual video gamer, glued to my Gameboy 24/7. I’m not saying that I don’t condone video games. They’re fun and make for a great platform to interact with friends. On the other hand, there’s nothing particularly ‘productive’ about video games. There are very few skills you can take away from them to improve yourself or apply in the real world. And what I realised was that video gaming was a bad fuel for boredom. This is where music saved me from going down that path of becoming a fully-fledged gaming addict. It sounds silly and melodramatic, but that’s honestly something I am thankful for. This is because learning to play the guitar became a fun, engaging and productive activity, taking the place of something that didn’t offer many positives. With the guitar, it gave me something to focus on, to get better at and become more proficient. One of the most important aspects of learning to play an instrument is self-discipline. This is where you set aside time and dedicate it to harnessing your skills. For children, discipline is an important trait to implement early, as it translates into school work and later life. Spending time trying to learn chords on a guitar or nailing a beat on a drum kit takes time and practice. It can take weeks or even months to accomplish a particular technique. With discipline also comes patience. It’s an essential part of the learning process. It takes a lot of devotion and commitment to learning the guitar, and patience is an important trait to maintain throughout. It’s as easy to quit as it is to get started, so realising that you’re not going to be an amazing guitarist straight away keeps you grounded. For me, playing my guitar is like positive escapism. When I was at school, I couldn’t wait to get home and start jamming to my favourite bands or learn new riffs. This is because after a day spent doing academic work, I’d like to employ the more creative side of my brain. But more importantly, it just made me happy! It was the perfect way to wind down after a long day. It helped me take my mind off of other things, as I could focus solely on playing and on improving my technique and repertoire. This is still relevant for me today. Instruments such as guitar, violin, piano or drums demand the use of both hands. At the start of the learning process, synchronising both hands to be in time with one another can feel like an impossibility. With practice it can almost become second nature, greatly developing coordination and motor skills. For drummers, it’s even more beneficial, as learning how to coordinate all four limbs enhances ambidexterity and reflexes. These skills can be used to improve performance in school sports activities, like tennis or football. It’s clear that some of the skills developed from learning an instrument apply to academic proficiency too. It’s not all just about the ways in which children learn to discipline themselves, as music interacts well with other subjects. Most notably, music goes hand-in-hand with mathematics and science. Understanding note values, time signatures and rhythms requires a working knowledge of maths. It’s used to discern rhythmic patterns, particularly as you employ division skills to break down musical notation and beats. This is also relevant to aspiring drummers. Reading from a stave for any instrument demands a level of academic understanding. For guitar players, learning from tabs also involves applying basic maths. With notes marked out by their respective fret numbers, the process requires simple counting and identification. This then leads to a broader awareness of where notes lie on the fretboard, as well as intervallic and tonal recognition. Music production and sound engineering both require a great knowledge of physics. Understanding acoustics, for example, relies on a competent grasp of the subject. It involves studying the ways in which sound travels, and how the size and shape of spaces change the nature of sounds and the way in which they are intercepted by our ears. These subjects are deeply intertwined. Learning a new piece of music requires a lot of repetitive listening to fully understand a melody and its rhythm. Being able to recognise and identify a short riff or motif and repeat it on an instrument requires concentration and practice to perfect it. Fine-tuning the ear can be advantageous for children’s focus levels. Even if you’re listening intensely to your instrument in a piece of music, you’ll naturally build an awareness of other instruments too. Identifying their tonal characteristics and traits can only help when eventually playing with other musicians. Learning a song is, at its core, a memory test. This can be a difficult hurdle for young children. However, challenging your child’s memory will develop their brain. Why? Because it teaches them to form, hold and recall memories more easily. This will help when they take their exams in school, as revising will become an easier process with a trained memory. Classical musicians mostly rely upon notation for musical cues and prompts because of the complexity of the music they play. However, a good memory is fundamental for pop and rock musicians. Playing a musical instrument leads to some amazing social experiences. It provides the chance to play alongside other like-minded people. This helps a child to develop social interaction. This transcends into later life, where working in teams and collaborating in groups is required. Standing up on stage with a guitar or smashing away on a drum kit looks cool. Which is why learning an instrument can be a great confidence and self-esteem builder. Performing in front of people is a nerve-racking experience and for children, it takes time to build this confidence. The more your child performs in front of people, be it just yourself or before hundreds, the more self-assured they will become. It also teaches your child how to improve after receiving constructive criticism. Learning how to take criticism and turn those negative feelings into positives boosts confidence. 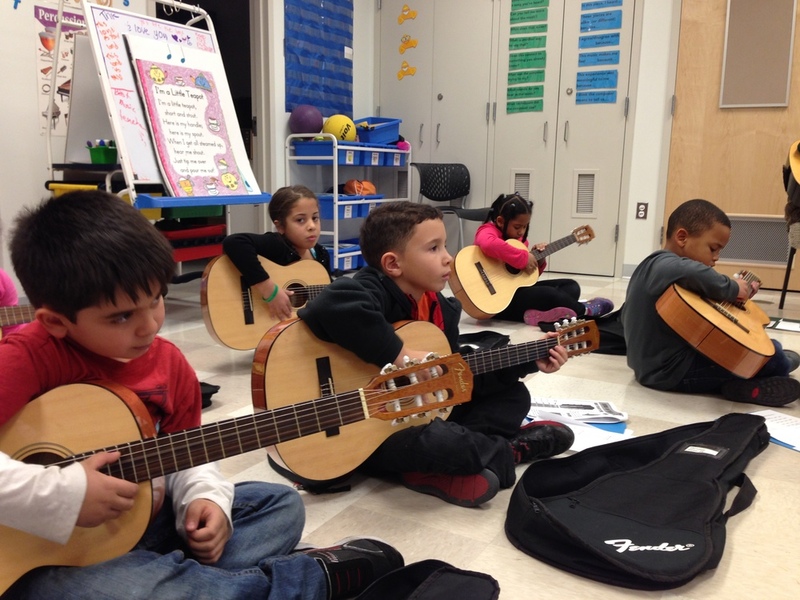 It’s clear that allowing your child to learn an instrument has many benefits in their development. It might be easy to assume that we are biased working at a music store. However, we strongly recommend getting your child into music, because playing an instrument is an art that we must keep alive and maintain. And most of all, it can make them happy! If you enjoyed this read, have a look at our other Learn articles. Want to set your child off on their musical journey? Have a gander on the Andertons website.